SCVHistory.com LW3036 | Film-Arts | Lobby Card: 'God's Country and The Man' (Trem Carr/Syndicate Pictures 1931). 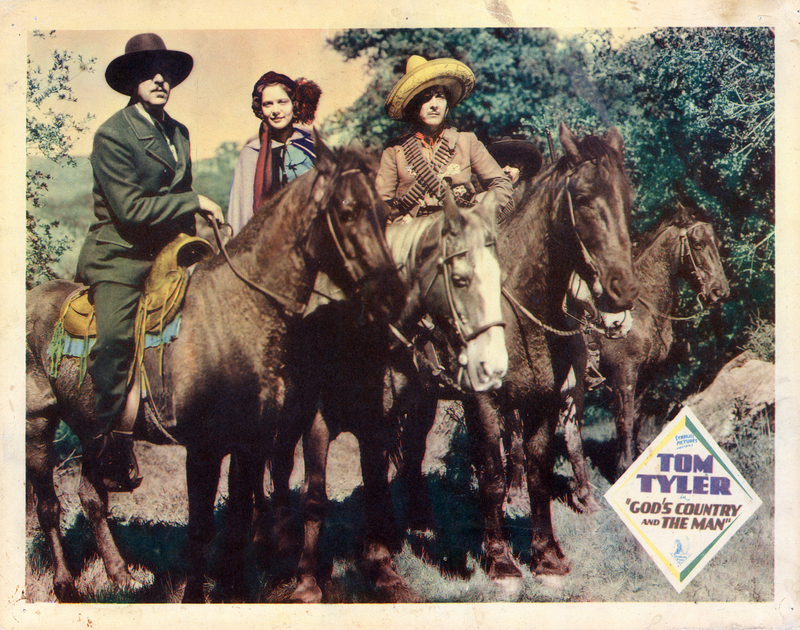 "God's Country and The Man"
Lobby card, 11x14 inches, advertising the Trem Carr production of "God's Country and The Man" (Syndicate Pictures 1931) starring Tom Tyler and George "Gabby" Hayes. This film was probably shot in Placerita Canyon, as were most pictures made under the short-lived Syndicate label. 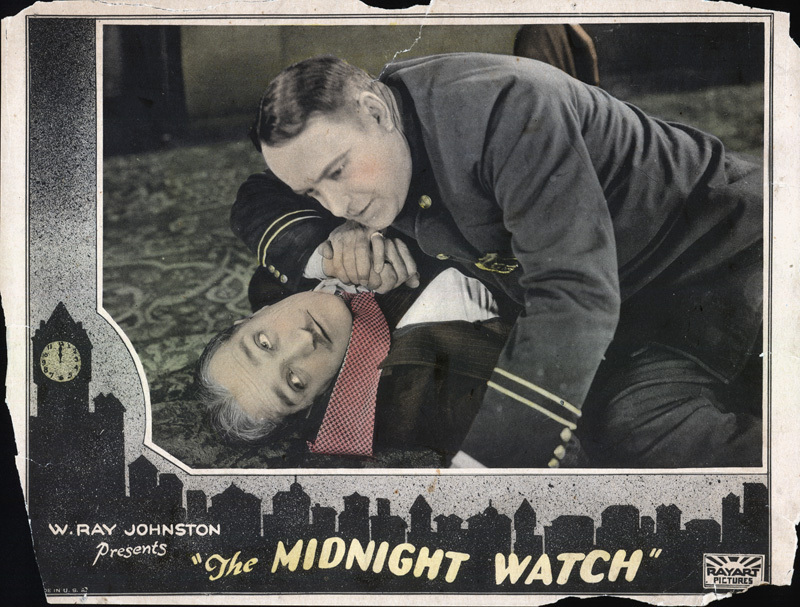 Syndicate Pictures was formed in 1928 by Carr, as vice president in charge of production, and W. Ray Johnston, as president in charge of marketing and distribution. In 1931 Carr and Johnston reorganized Syndicate into the first iteration of Monogram Pictures Corp. That same year (1931), Carr took out a five-year lease on property that later became the nucleus of Walt Disney's Golden Oak Ranch. When the lease expired in 1936, Carr and partner Ernie Hickson moved their Western movie town down the road to property in Placerita Canyon that would later become Melody Ranch. Hickson, who kept a well-stocked supply of Western paraphernalia in addition to building the Western town, was the set designer on "God's Country and The Man," as he was on all Syndicate, Trem Carr and Monogram pictures shot locally. John P. McCarthy is the director of "God's Country and The Man," and importantly, Paul Malvern is assistant director. Malvern's own company, Lone Star, would produce numerous films in the 1930s that were shot in Placerita Canyon and featured either John Wayne or his friend Bob Steele, son of the director Robert Bradbury. Archie Stout, another Trem Carr regular, is the cinematographer (cameraman) on "God's Country and The Man," which also features Betty Mack, Al Bridge, Ted Adams, Julian Rivero, William Bertram and John Elliott. Uncredited cast includes: Gordon De Main, Frank Ellis, Jack Evans, Al Haskell, Allen Holbrook, Frank Lanning, Jack Low, Merrill McCormick, Artie Ortego, Henry Roquemore, F.R. Smith, Tom Smith, Al Taylor, Slim Whitaker and Blackie Whiteford. LW3036: 9600 dpi jpeg from original lobby card purchased by Leon Worden.